For those of you who have visited New York City’s famed aerial greenway, the High Line, on a busy afternoon and found that it just doesn’t get the balance of suffocating crowds and dizzying heights quite right, you’re in luck. If all goes as planned, come 2018, Manhattan’s West Side will also be home to a monumental public art installation that masterfully blends human congestion and acrophobia. And it involves stairs … lots and lots of stairs. 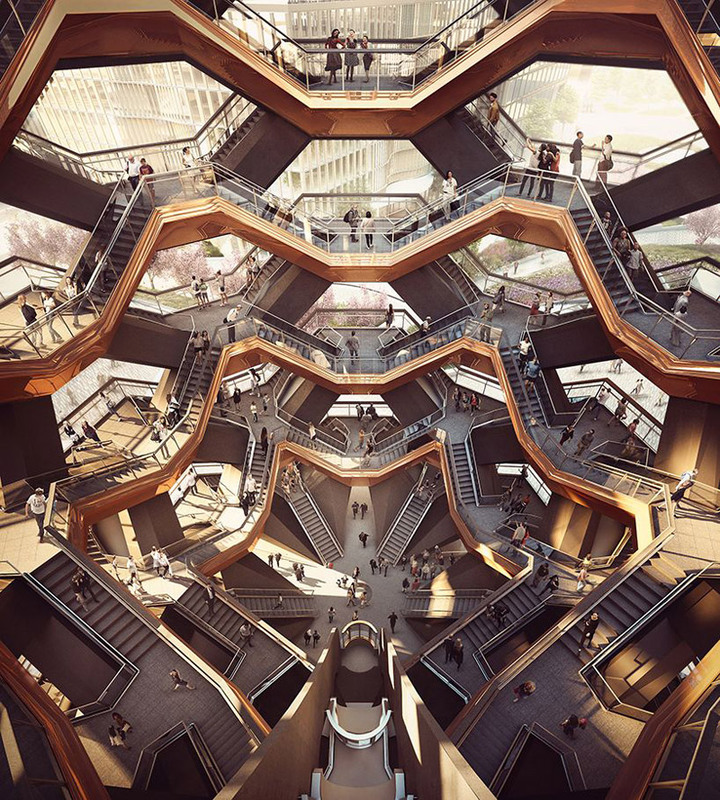 In fact, the scalable sculpture, provisionally dubbed “Vessel”, is all stairs: 2,500 individual steps and 80 landings spread out across 154 interconnecting flights of circular staircases that ascend 150 feet — roughly 15 stories — into the sky above the Hudson Yards, previously a massive construction crater that’s slowly but surely taking form as the largest real estate development project in the history of the United States (and the largest in the Big Apple since Rockefeller Center, which was completed in 1939). 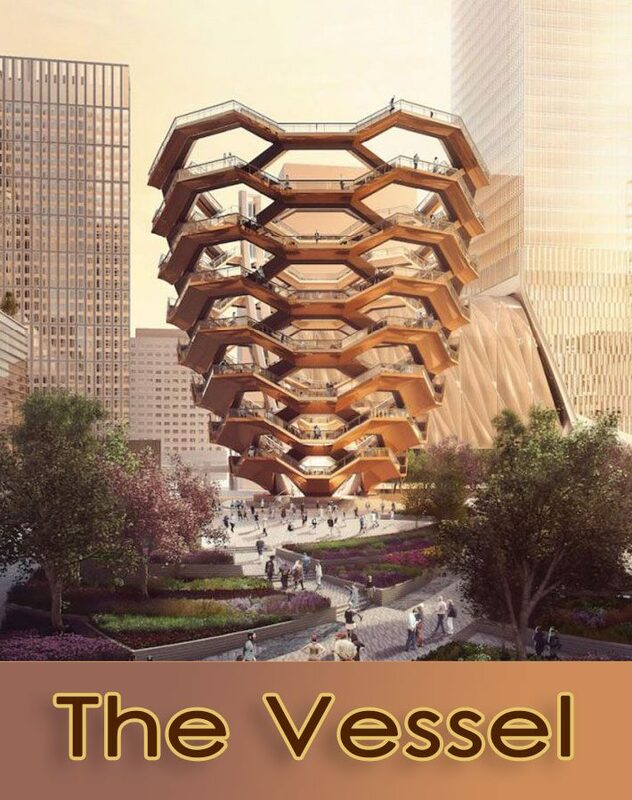 Resembling a sort of gargantuan lattice basket made from concrete and clad in a cooper-colored stainless steel skin, the 600-ton Vessel will serve as the vertiginous centerpiece of the skyscraper-laden Hudson Yards, towering above a densely planted 5-acre public plaza, Public Square and Gardens, designed by landscape architecture firm Nelson Byrd Woltz. 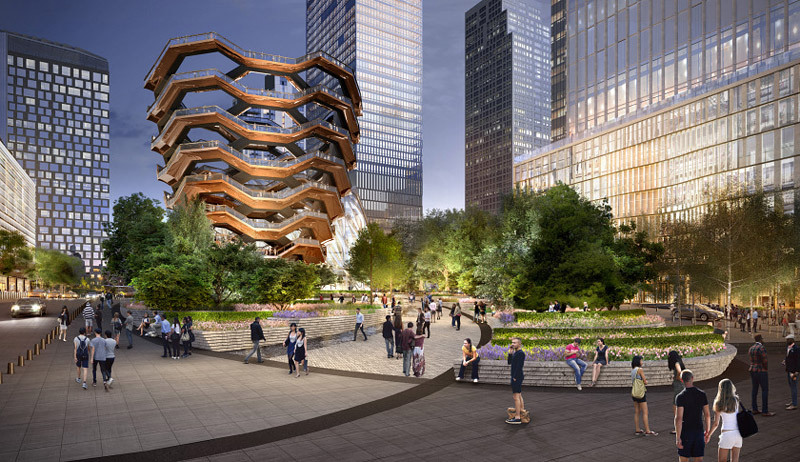 Aptly referring to Vessel as a “stairway to nowhere,” the New York Times likens the top-heavy interactive sculpture to a jungle gym for Generation Selfie. Fair enough. However, when I look at the decidedly futuristic design renderings, I see the atrium staircases of Los Angeles’ landmark Bradbury Building put on steroids and inserted into an M.C. Escher illustration. Or something like that. The designer of Vessel is non other than British multi-disciplinarian extraordinaire Thomas Heatherwick, the go-to guy if you need an unorthodox — and frequently contentious — architectural statement piece, be it a Thames-spanning “floating paradise garden” in London or a billionaire-backed offshore oasis that, when completed, would float in the Hudson River not too far from the Hudson Yards’ tower o’ staircase. 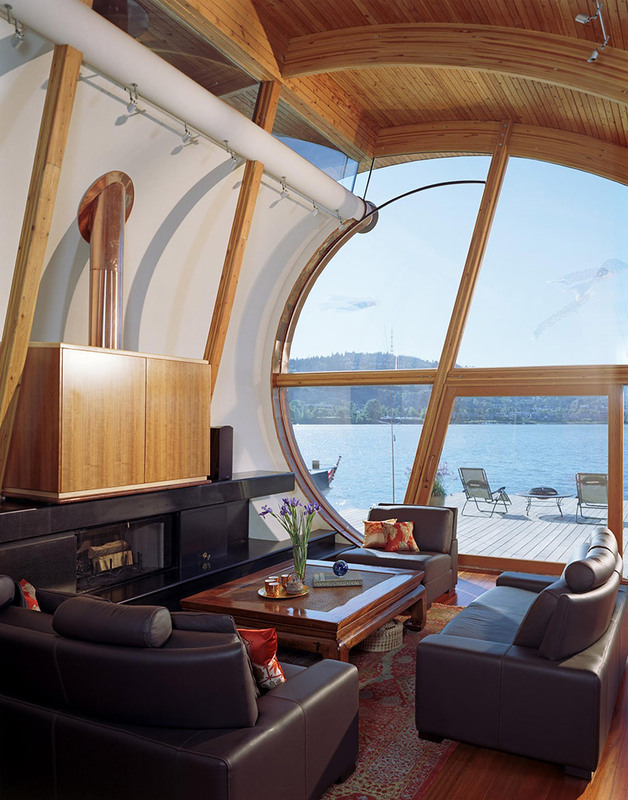 On a smaller scale, Heatherwick is noted for creating the 2012 Olympic Cauldron, London’s newfangled Routemaster double-decker buses and a small handful of rubberneck-inducing temporary pavilions. That “thousand people” bit has some a wee bit worried about crowd control, especially considering the sculpture’s close proximity to the tourist-luring High Line. Whereas the High Line leisurely stretches along Manhattan’s West Side for a little under a mile-and-a-half, the vertically oriented Vessel amounts to a zigzagging 1-mile clamber to the top within a structure that stretches 150 feet at its widest. 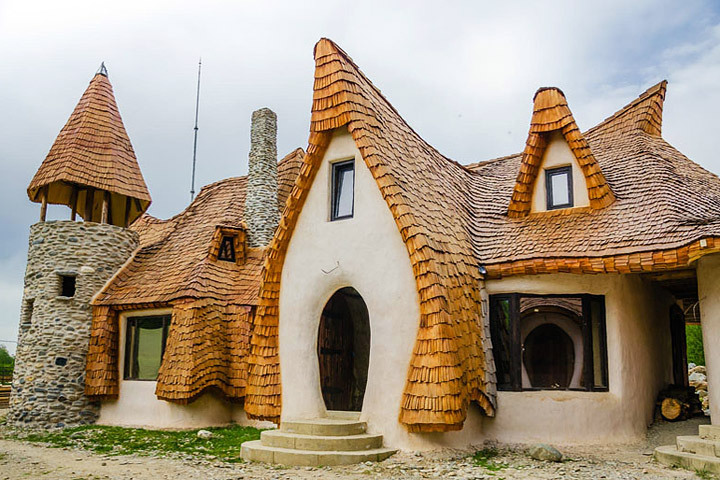 (The base is a mere 50-feet-wide). 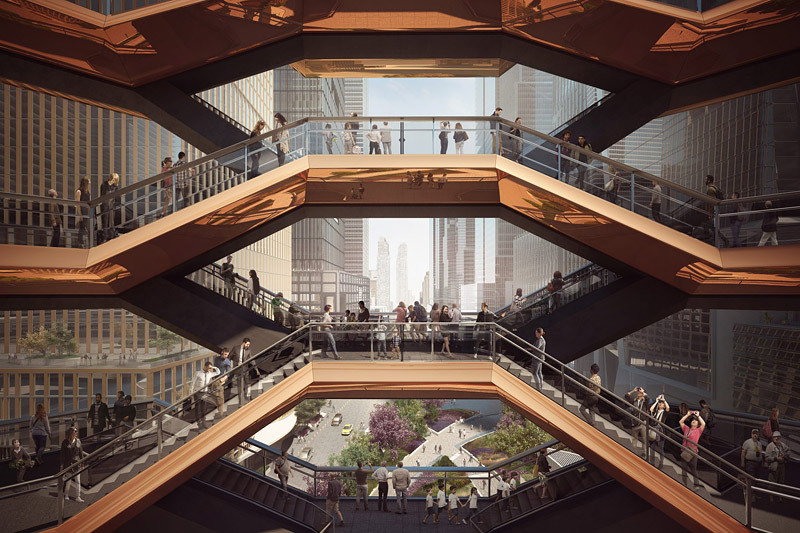 Boasting an estimated price tag of $150 million (that’s $60,000 per step, folks), Vessel is being privately financed by Stephen M. Ross of Related Properties, head of one of the two development companies behind the $20 billion Hudson Yards project. Construction on the project has already commenced in Italy. The sculpture’s prefabricated elements will be shipped to New York and assembled next year with an anticipated completion date in 2018. The easy case to make about Vessel is that it is extremely unattractive. Heatherwick, a master of publicity, actually seems to know this and compared his tower at a press conference to a garbage bin last week, as if to co-opt that analogy from the start. 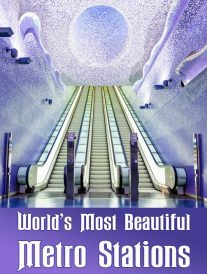 To my eye, it recalls a hypertrophied mall without stores or some sort of futuristic prison, or the overbuilt, alienating architecture that features in some of Andreas Gursky’s digitally altered photos, or Piranesi’s prison prints. The most generous analogy I can come up with is that it resembles an upside-down beehive smothered, for some unknown reason, in bronzed steel. Others have been more gracious, such as the editors of Fortune, who deem the sculpture as potentially being “Manhattan’s answer to the Eiffel Tower.” Keep in mind that the Eiffel Tower was detested by many Parisians when completed in 1889. Matters of aesthetics and scale aside, there’s no denying the aerobic exercise-related appeal of Heatherwick’s design. 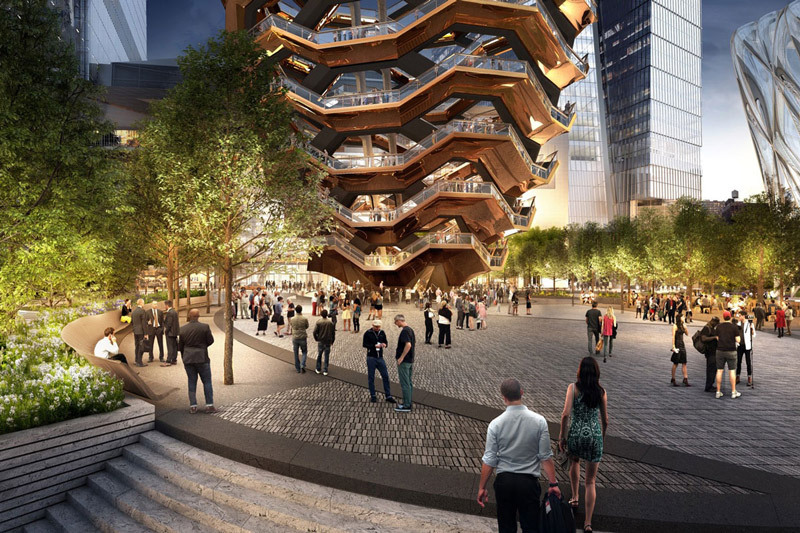 (“New Yorkers have a fitness thing,” Heatherwick observes to the Times.) Given the heart rate-elevating nature of Heatherwick’s sculpture (there will also be a glass-enclosed incline elevator incorporated into the structure so that those with impaired mobility can reach the top and get back down again), I’m going to go out on a limb and assume that Vessel already has a built-in super-fan in the form of former mayor and outspoken stair champion, Michael Bloomberg. Perhaps on opening day, Bloomberg can stand at the highest of the 154 staircases and give high-fives to — and pose for photos with — those who complete the ascent to the top of Manhattan’s newest and most physically vigorous tourist magnet.